“If I control the metaphors, I don’t care who makes law or policy,” I think someone once said. The “fiscal cliff” is a good example, referring to a pre-arranged tax increase and spending reduction. Putting aside that there are probably more apt metaphors, e.g. the economy as an addict with politicians providing a new “fix” (stimulation, quantitative easing) as needed to keep the emaciated junkie going a little longer. Let’s look at the fiscal cliff to see if that framing makes sense. The fiscal cliff is implied to be that pre-agreed “penalty” in the event that Rep and Dem factionists fail to achieve a US budget agreement by the deadline. But this interpretation seems to miss the fact that, even if such an agreement is made, there will still be a fiscal cliff looming. If we want to use the cliff metaphor, then we should be clear on what “the cliff” is. I think that is evident: the collapse of the current economic and monetary system, which would likely mean the devolution of the USA into independent entities. Knowing what “the cliff” is brings up some interesting questions. First of all, is it something to be avoided, or embraced? We have seen that modern states, whether democratic socialist or democratic corporatist, are incapable of both monetary restraint and respecting individual liberty. A breakup into something like the original American Confederation but better - a free trade zone with local sovereignty - would have its virtues. Identifying “the cliff,” we see it as the result of a long term unsustainable government tax/debt/inflation expropriation process. The babble in the newspapers over whether the celebrity rulers can agree on something, and what happens if they don’t, is rather ridiculous. 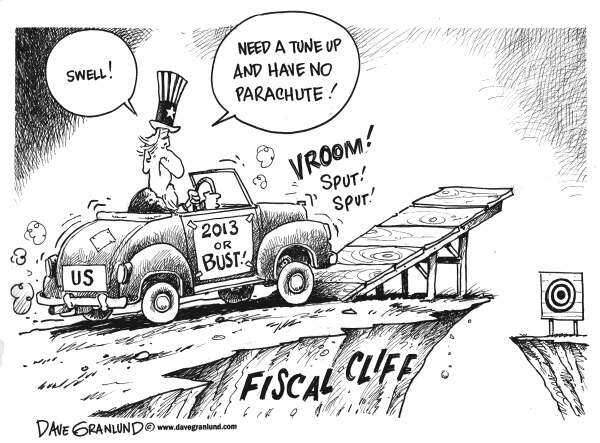 Whatever happens, the real fiscal cliff is still looming, and we’re probably going too fast to avoid it, anyway. The good news is that smaller, more efficient and people-oriented entities may soar from that cliff, leaving the corporate state as a relic of the military-industrial age.